A major producer of elongated copper milling equipment with a domestic sales share of 90%, IKUTA SANKIKOGYO Co., Ltd. is also highly reputed overseas. 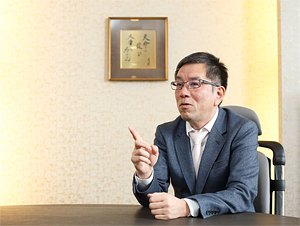 We spoke with present CEO Mr. Yasuhiro Ikuta who states that his staff make their own decisions and don’t need to go to him for everything. We learned more on the development of his staff taking initiative and the policies of this corporate culture. CEO of IKUTA SANKIKOGYO Co., Ltd.
Ikuta was born in Kyoto City in 1961. After graduating from university, he continued his studies in economics at the University of St. Thomas in USA. After working at Ishida Co., Ltd., He entered IKUTA SANKIKOGYO Co., Ltd. in 1989. He has been in his current position since 1999 after the passing of his parents – Vice Secretary of the Nihon Dokeikai General Incorporated Association of Kyoto and a registered member of the Institute of Moralogy. The company was founded in 1919 and incorporated in 1953. It expanded its business of developing and selling metal process lines with a corporate capital of 20M Yen and 63 employees. KYOWIND Co., Ltd and IKUTA Suzhou Mechanical Engineering Co., Ltd. China are also affiliated corporations. We spoke with Mr. Ikuta regarding his company’s majority shares in the domestic market. Ikuta: “I believe that it is the hard work of each and every one of our proactive employees. They take on their work with a high awareness of responsibility and are always striving to revolutionize the technology. To consistently develop their skills, we have a daily report policy. We share and update each other’s progress through a group mail system in every department. This allows me to manage and see the development of my employees on a daily basis. Whether there is a problem or guidance that needs be given, most of the issues are resolved within the department and is also effective to carry on the skillset of the team. Ikuta: “Just around that time, I had the opportunity to meet Mr. Akinori Meguro, former President of the Institute of Moralogy Business Administration. One of my seniors studying at the Institute of Moralogy invited me to a seminar saying that Mr. Meguro would be there. I went and sought council from him in desperation. 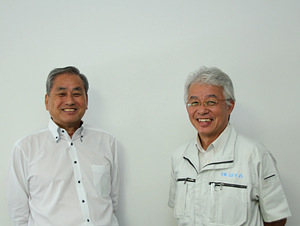 For a year, Mr. Meguro came to our office once a month as the vice president and helped us out of the rut. When he saw the financial reports he said “I don’t need a hotel, bring me a futon” and he slept right there in the office while he stayed to guide us. He taught us how to increase profits based on a sharing method of establishing a management team that could see the financial statements that only the president had access to before. We also implemented monthly management meetings and annual presentations on corporate policies. Ikuta: “It wasn’t that easy. I had so much on my plate, I didn’t have the capacity to tend to my staff. I don’t think they saw a future at this company. Some of the younger workers even got together and threatened to walk off. We somehow overcame that but at that time, one of the employees of the management team said “To honor our predecessor, we will support you.” That’s when I realized. My father wasn’t a dictatorial leader; he had a deep and honorable trust with his employees. I look back and realize that my father and his father before him valued and cherished their staff very much. Ikuta: “Before, everyone was a closed book. Our company atmosphere is much more open and people feel free to express their opinions now. Since about 2 years ago, I’ve had 5 members of factory management take part of in the administration meetings. Sometimes they are harsh, but I humbly accept their words and am grateful to be able to hear their true opinions. In doing so, they have become more aware of where the company stands financially and are proactive in developing higher revenue strategies. The administrative aspect is becoming more flat and we have created an organization that works stronger as a team. Walls between departments have been removed and we are all working together. It’s refreshing. 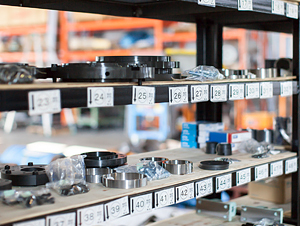 Technicians will go with sales reps to see clients so they can listen to their needs directly. Quotes can be issued quicker and communication is much smoother. As the 3rd successor of this company, I have realized that I must take our corporate philosophy to heart. The spirit of our foundation, the fundamental principles and action agenda – These were just words of a philosophy, but I make an effort to speak of the meaning behind these ideas to my employees during our morning meetings so we don’t stray from our origin. I will continue to work hard to keep a safe and bright working environment based on these principles that our predecessors have lived by before us. Work efficiency has been increasing since the implementation of Mr. Ikuta’s 3S (Speed, Simple, Symphony) philosophy.